The perfect start to your day, a complete breakfast meal with a good shot of caffeine, guarana, green tea, acai berry, multi vits, to name a few all in one convenient shake in 3 great coffee flavoured variations, the ultimate get up and go breakfast meal in one. As with all our own formulations, the ingredients have been specially formulated to give you the very best product available. No time for breakfast? no time for your coffee stop before work? no time full stop? 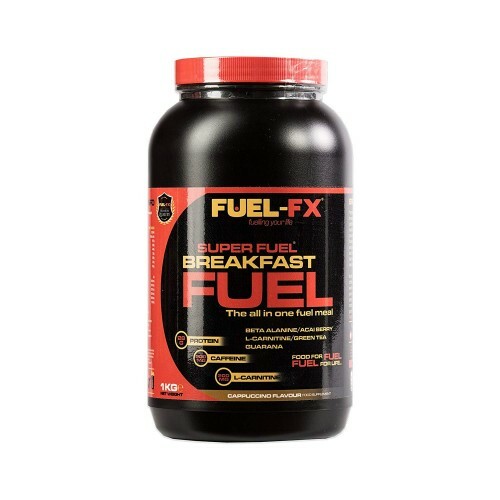 Well mix, shake and take in all the nutrients you need plus a good helping of caffeine to get you on your way, feel full, fuelled and raring to go for whatever lies ahead of you, go on FUEL UP.. with BREAKFAST FUEL. Take 1 or 2 scoops per serving depending on calories/caffeine intake you require or prefer. ALLERGEN WARNING: This product is manufactured on equipment which processes other products containing: Nuts, Gluten, Egg, Soya and Peanuts.